We don’t just come in and demolish a building. 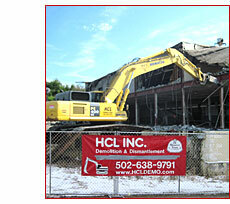 We are a full service recycler and licensed demolition contractor in five states. When you hire HCL Inc, you get our certified team members and no other outside businesses. We handle every aspect of the job with our in-house crew. We start by assessing the project from the ground up with safety as our first priority. We then generate an environmental assessment of the land and facility. The environmental assessment consists of removing tanks that may be filled with hazardous materials or containing materials that have been left behind. We then examine all aspects of the building and determine what can be reclaimed and recycled. Once we identify the items that can be salvaged, our team members get to the hands-on work. Our team members literally remove salvageable materials by hand to preserve the integrity of the material. Once the fragile material is removed, the machinery comes in.